The Washington Post has written about “a grass-roots backlash against secularism, homosexuality and changes introduced” during the time in power of a “Marxist-inspired” political party. But the story was not about the United States. It was about Brazil. The backlash to Marxism has not yet arrived in the United States, and it certainly won’t happen with Donald J. Trump’s candidacy. 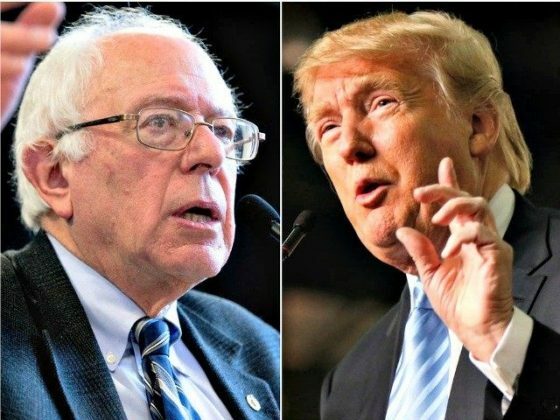 Trump has just demonstrated that he is scared of debating socialist Democratic presidential candidate Senator Bernie Sanders (I-VT). The Post story, “In Brazil’s political crisis, a powerful new force: Evangelical Christians,” is an amazing account from a liberal perspective of how Christian conservatives are taking back their country. One leading critic of the ruling Workers Party in Brazil said, “We saw that communism was in their DNA.” We saw this coming more than a year ago in our story, “Anti-Marxist Counter-Revolution in Brazil.” The obvious question is, Can it happen here? The answer is, Not with Trump. Some of these complaints could be made about the United States under Democratic Party rule. In fact, Obama’s Democrats seem to want to go even further and more quickly in a decadent direction than the Marxists in Brazil’s Workers Party. Consider thestory in The Washington Times that Bibles are being removed from the “Missing Man” tables in several Veterans Affairs (VA) clinics. The Missing Man Tables recognize prisoners of war and those missing in action. Senator James Lankford (R-OK) and Rep. J. Randy Forbes (R-VA), co-chairmen of the Congressional Prayer Caucus, sent a letterThursday to the Secretary of the Department of Veterans Affairs, asking why Bibles have been removed from the displays at multiple VA clinics around the country. The Post story needs to be read and understood by those forces in the United States anxious to overturn the Marxist policies pursued by President Obama over the last seven years. One of the lessons to be learned is that the official Catholic Church will be of no help in returning the country to conservative values. “With a population of 205?million, Brazil remains the world’s largest Catholic nation,” the paper notes. “But 22?percent of Brazilians identify as evangelical Christians, up from 5 percent in 1970.” It’s this growing force, not the Catholic Church, which has put the Workers Party on the defensive. Falwell’s son Jerry is now the president of Liberty University. However, he supports Trump for president of the U.S. But is Trump capable of leading the kind of conservative counter-revolution the United States needs? He is certainly not a Christian conservative and has never claimed to be. There’s no evidence that the Trump Train intends to run over and obliterate the secular and Marxist forces that are leading America to ruin. Instead, his message is mostly one of economic nationalism and populism. A good opportunity for Trump to prove to conservative Christians that he intends to save the U.S. from moral decay was missed when he chickened out of a debate with Sanders. After first agreeing to debate, he backed out, saying “it seems inappropriate that I would debate the second place finisher” in the Democratic primary. It is more likely that Sanders would have made mince-meat out of Trump. The fact is that Sanders is a committed Marxist who can argue the case for socialism, and Trump is committed to his own brand, not the Republican Party or conservatism. The only possible way for Trump to have beaten Sanders would have been to use the Alinskyite tactics he used on other candidates in the Republican primary. That is, to call them names and/or belittle their appearance. But while those tactics were effective against Republicans, they may not have worked against Sanders. The best that Trump has come up with against Sanders is “crazy Bernie.” But Bernie doesn’t appear crazy to millions of Democrats and young people attracted to the free stuff that socialism promises. Sanders does have a crazy appearance, with his white hair messed up on top of his head. But Trump’s hair can generate its own share of jokes. What’s more, Sanders makes a lot of sense, in the same way that the Workers Party came to power in Brazil with the support of the liberation-theology wing of the Catholic Church—by pledging to do something about the plight of the poor. What happened in Brazil before the backlash is now happening in America. The nation is moving in a “progressive” or left-wing direction. Overall, in general election polls, Sanders beats Trump handily. An NBC News/Wall Street Journal poll finds Sanders beating Trump by 15 points, 54 to 39. A CBS News/New York Times poll found Sanders on top by 13 points. In North Carolina, Sanders beats Trump by 4 points. In California, Sanders beats Trump by 17 points. In New Jersey, Sanders beats Trump by 24 or 12 points, depending on the poll. In New Hampshire, Sanders beats Trump by 16 points. In Georgia, Sanders beats Trump by 5 points. In Ohio, Sanders beats Trump by 9 points. In Arizona, Sanders beats Trump by 1 point. John Bowman’s just completed book, Democracy: And Why It Will Fail in America, looks at the popularity of socialism in the United States. He had predicted the advance of Marxism in his 2005 book, Socialism in America. Democracy, Bowman argues, carries the seeds of its own destruction, of which socialism is just one kernel. The Sanders candidacy and movement, he argues, were natural follow-ups to the demands for free healthcare, housing, education and welfare. Donald J. Trump doesn’t have the depth or intellectual background to argue against this. That’s why he chickened out of the debate. Sanders would have mopped the floor with him. This entry was posted in Politics and tagged AIM, Bernie Sanders, Cliff Kincaid, Communists, Donald Trump, Politics. Bookmark the permalink.